is often synonymous with two things: superb amenities and an easy-breezy lock-and-leave lifestyle. Many condo communities, such as Toscana of Desert Ridge on the Scottsdale-Phoenix border, are enhanced by top-notch amenities such as an on-site concierge director who is available to book golf, spa services, dinner reservations and other activities in and around the Valley of the Sun, said Shantelle Monongye, a representative of the community’s developer, the Statesman Group of Companies. What’s more, condo owners “receive valuable savings through our Toscana VIP Resort Club Card toward several neighboring vendors providing dining, golf, spa services and other activities,” Monongye said. In addition, Toscana’s lifestyle director coordinates monthly activities such as wine tastings, casino night, Friday night social gatherings and yoga classes. Toscana offers one-, two- and three-bedroom condos that are fully furnished and accessorized, Monongye said. Amenities include heated resort pools, outdoor barbecues, outdoor seating and lounge areas, pathways with water- and fire-features, fitness centers, media centers, a game room, a boardroom/business center with wireless internet and computer access, a caterer’s kitchen and steam rooms with private lockers. 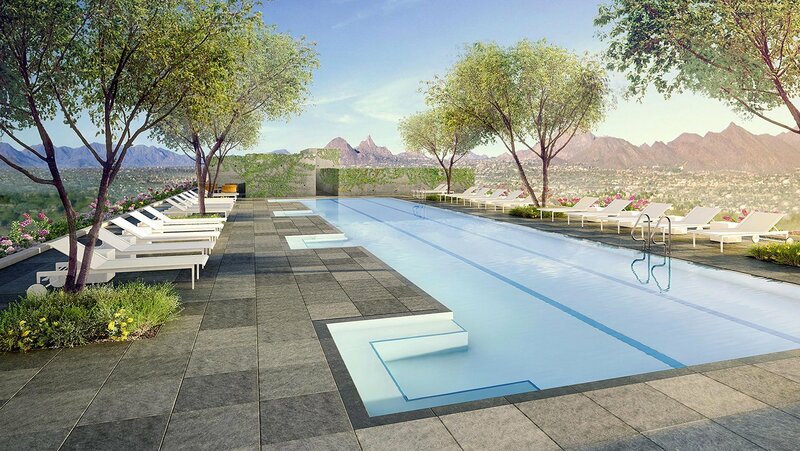 Like at Toscana, at Optima Kierland in Scottsdale, luxurious amenities help define the community’s lifestyle. On the ground level, he added, is the 16,000-square-foot fitness center and residents’ club “with the latest in machines and free weights, a Wellbeats studio and a yoga studio with Zen garden.” There’s also turf for outdoor training and stretching, an indoor basketball court, spa, cold plunge, sauna, steam room, theater, pool, outdoor putting green, barbecues, fire-pits and personal training and nutrition, he said. Whether you are a young professional who likes to travel every weekend, someone who just wants to simplify their lifestyle or a right-size buyer who no longer wants to take care of a pool and a lawn, people looking for a lock-and-leave lifestyle want to do just that, said Sue Goodrich, vice president of sales and marketing for Cachet Homes. Cachet is the developer of Cachet at the Wigwam (located in Litchfield Park), a mix of condominiums, townhomes and single-family homes. “You can lock the door and not have to worry about lawn or pool maintenance but still have the benefits of homeownership,” she said.